Reports out of Moscow say civilian GPS and GLONASS device users are victims of a GPS jammer. Taxis and Pokemon Go gamers report their satnav devices give widely varying locations. Sometimes they show them 30 kilometers to the southwest at Vnukovo Airport. So far no one has admitted guilt. If you’re out of the house and need to to get online, it’s nice to have a handheld WiFi analyzer so you know which of the hot spots indicated on your WiFi menu will be the best choice. If you’re setting up a WiFi network in your home or office, wouldn’t it be nice to know the range of your coverage so you can fix any problems now instead of later when you really need it? If the chosen network channel is not working as well as you think it should, how would you go about finding out why? 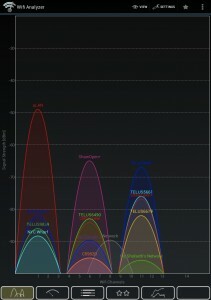 If you have an Android tablet or smartphone you can have a free WiFi analyzer just by downloading an app. Getting lost is now obsolete. There’s just no excuse anymore. Delorme’s new inReach™ satellite messaging device keeps you connected no matter where in the world you are. Leveraging the Iridium satellite constellation you can send and receive short text messages with a device that fits in a shirt pocket.